Late December weekend. You know what that means: holiday parties all around! I have two or three this weekend, plus hosting one. Yikes! 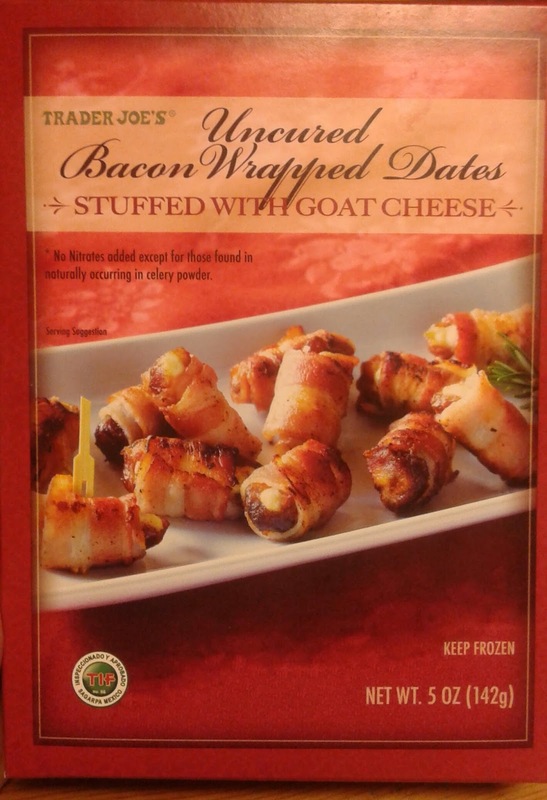 Might as well bring something really easy and really tasty to share...like Trader Joe's Uncured Bacon Wrapped Dates Stuffed With Goat Cheese. Seriosuly, rip a box open, stick in the oven for a couple minutes, and voila! You've got yourself one fancy hors d'ouevre. Each component works so seamlessly together - the medjool date, the goat cheese in the crevice where the pit was, and the apple smoked bacon wrapping it all up and holding it tight. It's a smoother-than-aniticipated bite that highlights the best aspects of everything involved - the salty-sweet awesomeness of truly good bacon, the soft creaminess of the cheese, the savory depth of a good date. I only wish for the price ($5 or $6 for a box of ten) either the dates would be a little larger, or there'd be a few more tossed in just to make it a little better value. We like 'em. Double fours. I made a balsamic glaze to drizzle over these right before I served them. They were amazing. I had a box of these in the freezer and when baked up for Halloween dinner I was able to convince my 11 year old that they were roaches. Totally grossed him out.